What Kind of Traffic ? Specific targeting for desktop traffic, with advanced options. You can target anyone, anywhere! You can target any ISP just one click away. More than 20,000 ISPs in inventory. Optimize your traffic, bid, quality with parameters passed to your tracking platform. Sign up and start using PopMajor, advanced PopUnder network. Create your campaign if you need traffic, millions of high quality hit one click away. Have high quality traffic? Add your website for review. Add your code to your site and start earning. 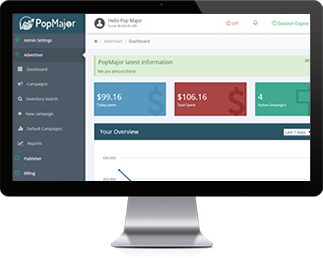 You can real time bid on PopMajor. This makes you buy high quality traffic without losing a penny. If you are winning, why wouldn't you pass other advertisers and get all the traffic? Targeting options for advertisers are brand new. Innovative technologies in terms of targeting makes your advertising experience so smooth. You can target by GEO, ISP, OS, Device, Time, Category, blacklist, whitelist ids and much more. Advanced dashboard for our high quality publishers lets you see your situation at a glance. Add your website and after it being approved, you will generate your code according to your needs. 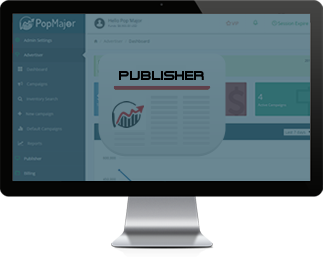 Advanced statistics system enables you to follow what PopMajor served from your site. You can blacklist campaigns from competitors or the ones not good fit for your visitors. Advertiser dashboard for a quick peek for your activity. Easily create campaigns with advanced targeting including ISP. Mobile, 3G, ISP based, Wi-Fi traffic, target any OS, anything you like. Check your reports, check our inventory for traffic estimation.